Planning a safari baby shower? 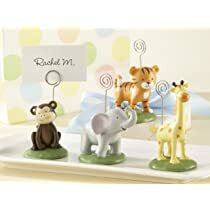 Baby showers can be so much fun to plan and organize – and a jungle / safari theme is a great choice! You may want to keep things simple and only opt for a few safari style decorations. Or you may want to go all out and have everything from the invitations to the decorations to the food to the party favors coordinate. What I love about the safari theme is that it is so versatile. Keep things neutral with jungle animal colors in their natural state. Or go pink with pink safari decorations. Or go blue with blue safari decorations. You can even mix it up a bit – the natural safari colors with just a hint of blue or pink. Give your guests a preview of what is to come with a safari styled invitation to your baby shower. 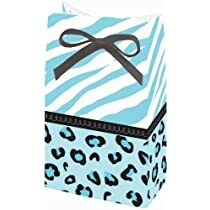 Sometimes folks like to decorate their gift in a special way – and if they know the decor of the baby shower is along the jungle / safari theme, they may enjoy finding the appropriate wrapping paper or gift bags. Check out the following invitations that you can buy – either premade ones that you fill out the details of when, where, etc. or personalized and customized printed invitations. 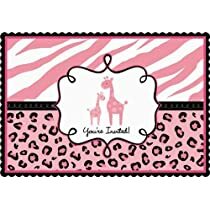 Pink Safari Baby Shower InvitationsCheck price here! 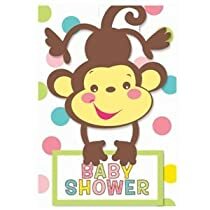 Monkey Baby Shower InvitationsCheck price here! 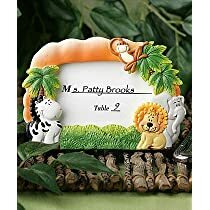 Safari Boy Baby Shower InvitationsCheck price here! Blue Safari Baby Shower InvitationsCheck price here! King of the Jungle InvitationsCheck price here! Safari Girl Baby Shower InvitationsCheck price here! Save yourself the work of filling out each invitation by hand! You can customize the text and layout of these personalized safari style invitations. Click on each one to learn more about them and how to order. One simple way to decorate your room is to use these inflatable animals. They measure approximately 18″ to 24″ when inflated. One thing to know beforehand is that not all of them stand by themselves when inflated. You could either hang them from somewhere or use double sided tape on the bottom of them to help them stand. Scattered around the room – by the gifts, by the food, by the entrance – would give a nice safari type feel to the room. You can get these inflatable animals here. Balloons make great decorations, making any room look festive! These balloons work wonderfully with a safari jungle theme baby shower. 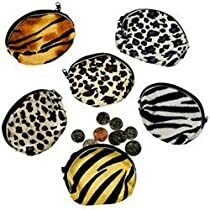 The package contains 3 tiger, 3 zebra, 3 leopard and 3 cheetah style balloons. They can be filled with either air or helium. According to the reviews, they are sturdy, nice looking and work great with the safari theme! You can get these balloons here. These safari style tin pails look great filled with candy, peanuts, small crackers or whatever else you can think of. Use these on your food table or at the tables where your guests will be sitting. You could also use these as “favors”, putting them by each persons seat and allowing them to take them home. Get these safari style tin pails here. Hung around the room using yellow rafia ribbon and thumbtacks, these animal print lanterns add a special touch! These are somewhat fragile and need to be handled with care. If they do get squished, you can fix it by folding it back up and then opening it up again. These balloons are a great choice if you are looking for girl / pink safari baby shower ideas. If you like the design, you can get lots of items with it for your baby shower – table covering, plates, cups, favor bags and other decorations. Check out all the Sweet Safari pink baby shower items that you can get by going here. Another option is the pink wild safari design. The foil balloon pictured here is 18 inches. If you like the design, you can coordinate your decorating with cups, napkins, plates, tablecloths, confetti and more. Get the pink Wild Safari foil balloon here. 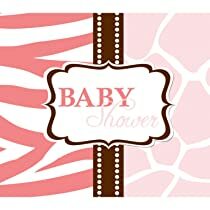 Check out all the Wild Safari pink baby shower items here. These blue safari balloons make cute decorations. 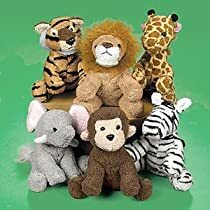 This balloon kit comes with a large 42″ x 25″ Giraffe balloon, two 18″ cheetah and zebra print balloons and two 18″ blue & white animal print balloons. You can purchase this package of blue safari balloons here. 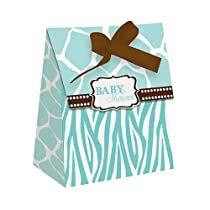 There are more Sweet Safari blue baby shower items. See them all here. The wild safari design offers a slightly different look for your blue safari theme. The balloon is 18 inches. Coordinate it with plates, cups, tablecloth, even lollipops, for a wild safari look! Get the blue wild safari foil balloon here. See all the blue Wild Safari items available here. Deciding on a cake for your baby shower can by challenging! One option is to go to your local grocery store and order a sheet cake. 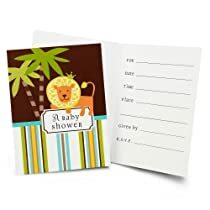 They usually have a lot of designs to choose from and they probably have something that could work for a safari themed baby shower. A cheaper alternative is to bake a cake or cupcakes and then decorate them yourself. Take a look at the ideas below for cupcakes and cakes that you can make! This first video gives you a look at how you can use buttercream frosting and make a great safari themed cake. 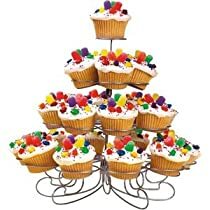 Once you have your cupcakes made, you can display them very nicely with a cupcake tower. 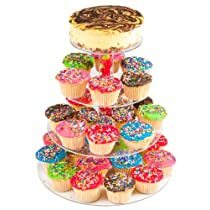 A cupcake tower doubles as a centerpiece for your table and really shows off your hard work! 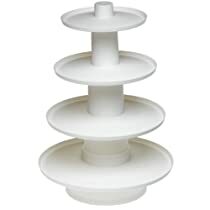 The selection of cupcake stands pictured below are some of the most popular ones and the highest rated. Some hold a specific amount of cupcakes, while others can work with a variable amount. Not only are these great for baby showers, but you can use them again for birthday parties, picnics, holidays and more. I’m going to admit that I had never seen this before – but it truly is a “border” that you put around your cake – either homemade or store bought. Made of sugar, it is gluten free and dairy free. 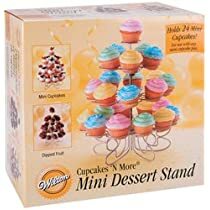 There is a chart by the images that shows you how many packages you need for your size cake. Take a look at the chart and learn how to use these here. 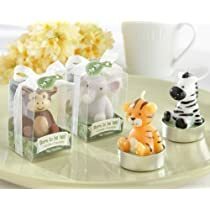 Everyone likes gifts and you can send your guests home with some lovely favors that really match your safari theme. A common “favor” to send home is a bag or box filled with some type of candy, cookie or other small edible items. 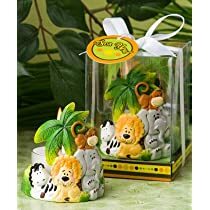 These gift bags and boxes work great with a jungle safari theme. Theses mini diaper cakes are easy to make and look festive as a centerpiece on the tables. 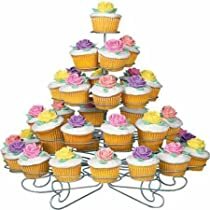 You can top the “cake” with a flower like she does, or you can use small stuffed animals, or a bow and some balloons. Use your imagination to come up with your own ideas that fit well with your other safari decorations! 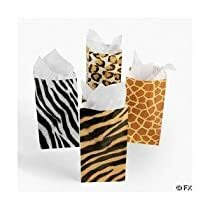 These may not be for everyone 🙂 but these can make a nice addition to your safari themed party. Placed on the tables, these will add to the general decor of the room. These can also be used as favors for your guests to take home. If you have children coming to the baby shower, these can be a fun thing to give them. These cups come in sets of 12. Check price here. While you probably don’t need cups with lids for the adults at your party (although they can be useful if you won’t be eating at tables), you can just use the cups without lids. Cute, nothing fancy, but fun to use for some added decorations. These 8 oz. Hefty cups come in packages of 12. Check price here. These animals are large – the giraffe measures 9″ x 13″. 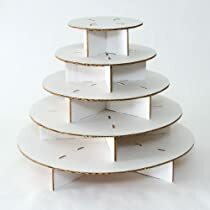 I can see these scattered around the room – maybe on the gift table or the food table or on a table by the entrance where you have a guest book placed. Give these to the expectant mom as a gift for her baby to play with when he/she is a bit older. In the meantime, they can be used to decorate the nursery. I thought these were cute enough to include here – but whether or not you can use something like this depends a lot on the room you will be in. These jungle stickers could really dress up a plain wall if you have a wall that needs some decorating. Like the set above, these stickers could work well if you have a bare wall that could use some easy decorating. These stickers are a bit more lifelike in appearance than the set above. Give your guests a taste of Africa with rooibos tea. Enjoy this tea from South Africa – a fruity flavor that is neither too spicy nor too sweet. I hope you had fun looking at all these safari baby shower ideas! Have a great time at your baby shower!